We offer wide variety of Garland that maybe be customized specifically your your needs. This eleminates frustrating overages and possible safety hazards that a look strand of garland can cause. Each Garland strand can be cut or sent as one continuious stand up to 100 feet. We also have a wide variety of prelit and unlit garland that allows you the best vavlue or convenice based on your need and budget. The 50 Ft.Camdon Fir Christmas garland has no lights with a 12 inch diameter and 1332 tips. 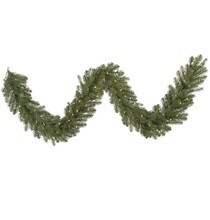 Our 18 x 9 Princess pine prelit Christmas garland and lights has thick, dark green mixed branches. 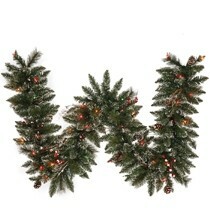 This outdoor pre-lit garland and lights measure 18 inches across. 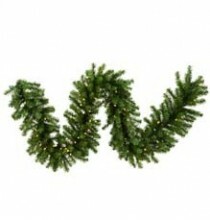 Our unlit Canadian pine garland has 2200 medium to dark green needle tips. This commercial garland is 100 feet long and 10 inches in diameter. It can be used both outdoors and indoors. 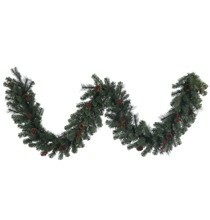 This Canadian Pine garland is value priced. The Christmas garlands have medium to dark green needles. These long garlands have a 12 inch diameter and are 100 feet long. It has 2860 tips.